Upon arrival in Vientiane you willbe welcomed to Laos’ capital byyour guide. Drive to yourhotel for check-in. Lunch at a local restaurant before starting your sightseeing tour of Vientiane. 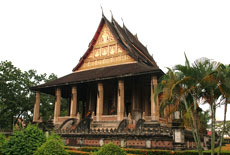 Visit the religious museum of WatSisaket, the oldest temple that survived the Siamese war of 1828. Its cloister contains more than 8000 Buddha statues. Wat Ho Prakeo, which once housed the Emerald Buddha statue PraKeo, is next on the list. 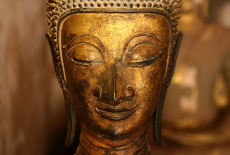 Today it contains a collection of Buddha statues, antiques and artifacts excavated around Vientiane. Then you will head toThat LuangStupa, the national symbol of Laosand the single most important monument in Laos.It was built to cover a smallerstupa containing a piece Buddha’s chest bone. The tour ends at Patouxay, Vientiane’s very own Arch de Triumph, built recently in commemoration of those who died during the wars in the past. Overnight in Vientiane. After breakfast, you will head to the outskirts of Vientiane, following the road along the Mekong River to visit Xieng Khuan Buddha Park, the park, 28km east of Vientiane, containsover a hundred status of Hindu divinities and Buddha. You drive past villages on the bank of the Mekong and will be rewarded with beautiful views of vegetable gardens and tobacco plantations.It is a perfect photo opportunity and the chance to see rural life in Laos. You will also get a chance to see the Mekong Friendship Bridge, which serves as the border between Laos and Thailand . Return to Vientiane town and visit Ban Nongbua Thong, a hand-weaving village. Take a walk along the Mekong’s riverside before heading back to the hotelfor the night. After breakfast you will fly to LuangPrabang. Arrive in LuangPrabang ,and check-in at your hotel before visiting WatVisoun, the 16th century temple that serves as a small museum for religious artifacts,WatAham, the early 19th century temple, whose two guardian figures at the foot of the steps represent two characters from the Ramayana - Hanuman, the Monkey God and a fierce Yaksa,WatXiengthong, the 16th century temple which, more than any other temple in LuangPrabang, epitomizes the elegance and grace of LuangPrabang’s architecture. You will then climb the 328 steps leading to the summit of Mount Phousi that dominates the skyline of LuangPrabang offering the finest panoramic view over the city. Overnight in LuangPrabang. After breakfast at the hotel, you depart to visit the National Museum at the former Royal Palace which houses the collection of valuables including the famous Prabang Buddha statue and gifts received from foreign dignitaries.You then drive south for 30 km to visit Kuang Si Waterfall, which, though not very high, is spectacular and beautiful with a lush green national park surrounding it. You stop en route, to visit Ban NaOune, a small village of the Hmong hill tribe, probably the best-known minority group in Laos. Just before arriving at Kuang Si Waterfall, you will visit another village of the Khmu minority group, named Ban Tha Pane. Picnic lunch will be served in the shady park nearby Kuang Si waterfall. There is plenty of time to relax and swim in the cool water, before you head back to LuangPrabang in the late afternoon. Overnight in LuangPrabang. Full breakfast at the lodge, before boarding the boat at 7:00am for the second leg of the cruise. En route a stop is made to observe rural life along the Mekong and visit minorities. 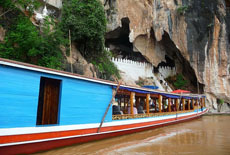 A buffet lunch will be served on board as you continue to HoueiSay where you will arrive before 5:00pman have the option tocontinue to Chiang Rai in Thailand on the same day.Asiatica Travel’s services end here. Huay Xai (Hui Sai) is the capital of Bokeo province in northern Laos. Located in the left bank of the Mekong River, in the opposite side of Chiang Khong town of Thailand, Huay Xai is the passage to the north between the two countries. 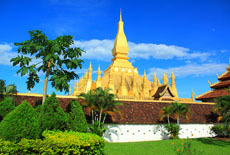 It is also a frequent stopover point of travelers before continuing their journey to other regions of Laos. Huay Xai, Pakbeng is often linked to Luang Prabang via boat, motor junks, and barges...on the Mekong River. A long yet beautiful path! 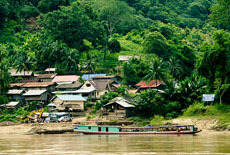 Being a passage between Huay Xai and Luang Prabang, Pakbeng is frequently visited by travelers. You will find several ethnic groups, particularly Khmu or Hmong people, who come to the morning market to sell their textiles and handicrafts or exchange goods.